I came across an old necro thread about the zeny knife and cramp card. Apparently DrAzzy said its not worth it at all, but he also stated that he himself has not tested this out whether or not if using a double zeny knife and 2 cramp cards plus the new costume: show me the zeny that came out really works at all or if its worth it at the end. So my question is has anyone tested this out yet? And if so, is it worth it? If you are super new, it might be worth it, but will not be worth it in the long run. Give it a try yourself and see if it satisfy how fast you are making zeny. my recommendation is to get a pj like a GX to 175 as fast as possible and start doing instances. This is the fastest way to make zeny, through instances. Make class (not necessary Gene only) solo ET & you can earn zeny fast there too. Trust me, such a thing Isn't worth it, It's just all around better to focus on leveling until you can survive mobs on a map that has rough elu/Elu drops(like magma 1 for instance), farm+lv there until you can survive on a map that has a sought after super rare drop. I made 90% of all the zenny I ever made by doing this(In my case, I went Magma 1, then to chiv. If you're just looking for early fast zenny, prontera culverts, and then Payon cave 2 works well to get started. So most people come to an agreement that it it is not worth it. Now my question is, why were those items created in the first place if it does not serve a good purpose other than making enough zeny to cover up for warps? 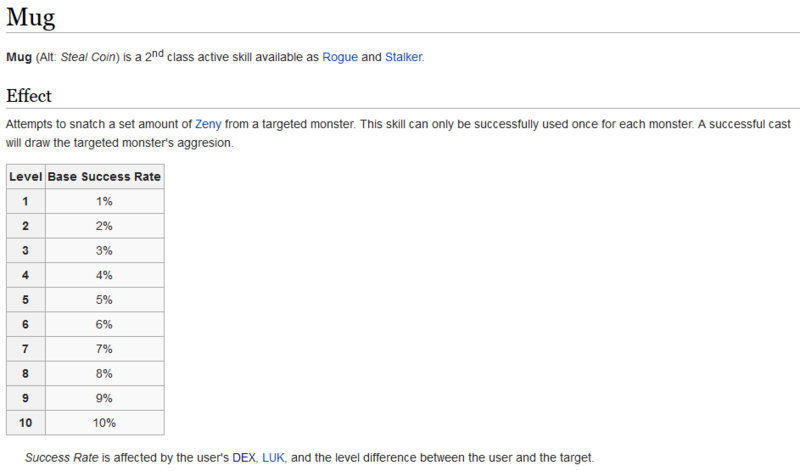 Kudos to those people who actually farm zeny "the old fashion way" and have made millions from it. I give my respect to those kinds of people. Im thinking some people get tried of doing ET runs and instances plus greeding in eden TI, but somehow they never get tired of "grinding"
There are a lot of items created just to be fun little things or unique rares for a enemy to drop. Also the zenny knife is downright ancient, RO was completely different back then, and I doubt the developers ever thought RO would develop into the titan it has become. It's such a different game then what the zenny knife was made for. Edited by Zoltor, 06 December 2018 - 08:03 PM. But if its zeny per trip/hour I prefer nogg road. You can get like 1-2m or more per trip by purely npc-ing the loot there. As for now, we have a lot of zeny already generated in the server, so its quicker to just run instance and sell the loot to other players. It is faster to make Blacksmith, and go greed in OD2, rather than using something like that ..
1. Create ranger, buy prism ranger scarf. Level up till 130 and start doing ogh/et/other instance earlier. Let's take a gander here, zeny knife is worth 50m each according to ragial's price. x2 that's 100m give or take. Cramp card is being sold for 3m currently x2 that's 6m. Costume: show me the zeny is worth 200m? The lowest price ive seen that item is 300k zeny. Probably some people trolling around to manipulate market prices. 306m total give or take for the zeny making gears and cards. How much time would it take for me to make that 306m back just from killing loads of mobs? weeks? months? a year maybe? They should've made those gears like if you make it to +14 it will increase 25% increase of making zeny and increase instead of making 500z to 10k or 100k something like that. Then I would say not too shabby. Go and make your own Mushroom Farm like me. Mostly everyone agrees that its not worth it. Now let me ask another question which ties to the title of the thread. Since zeny knife: Costume - show me the zeny and cramp card is off the chart. What about farming low mid and high TI? let's say I make 3 mechanics and I buy proper gears. Is it worth farming low mid high TI with mechanic? I understand farming low mid high TI is nothing compared to doing instances ET and mvp hunting. What I do know is that farming low mid high TI is far way much better in terms of making zeny rather than using zeny knife and costume + cramp card? What is the rate of zeny of farming low mid and high TI, anyone know? 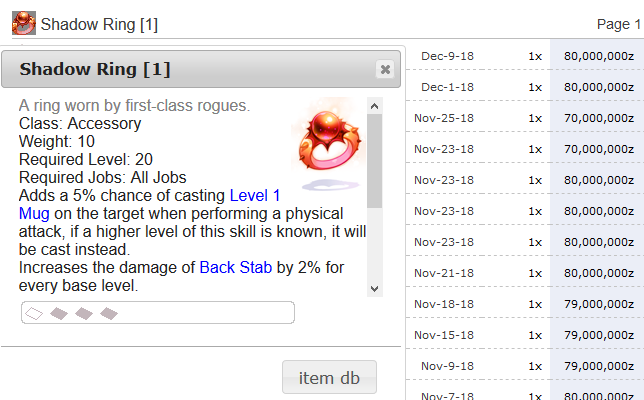 @OP, easiest way for any new player to make zeny is to make a 99/70 mastersmith and start upgrading lvl 3 weapons with the upgrade skill. you get something like an enriched chance per upgrade if your job level is 70, and its relatively easy to farm your own ori/crimson weapons. if you need to make zeny badly before then, keep using the smith because it can get the quest skill Greed and you can just go farm orc dungeon 2 as mentioned above. aim for neutral crimson maces, holy c. daggers/katars, neutral crim sabres, crim bows, elven bows, crim rods, etc. all of these things drop relatively easy. use db.irowiki.org or divine-pride.net to figure out who drops what. they sell decently at +7 as well, though +8 isnt actually too hard. come out swingin' with bulk and it wont even matter if you fail because numbers will guarantee your success. I'm waiting for someone to tune on that as well. What about the sleeper card? What does that card do? The description says you have a chance of making 'ZZZ' item for 1% each time a fish or shellfish monster is killed. I searched it on google and found nothing. So does anyone know what it does? What the hell is a 'ZZZ' item!? I'm thinking it's zeny but I may be wrong. I tried some of these combos farming and grinding like a dog mob training & killing thousands upon thousands of monsters and drop rates are excellent! This is where the gold is! You get more zeny gather the items and selling the non-important to NPC. Edited by S207, 13 December 2018 - 01:30 PM. Nice, never heard of that item before. Is it new? A lot of people say these items and card combos that drop consumables are a waste of time and is somehow too impractical. Somehow I do not share that view point 100% with what others say and think about this topic and ways on how to make zeny. I share their views more like 49%. I guess everyone forgot the good ol' days back then when OCP and cash shop items did not exist. Everyone forgot their old ways on how they first started playing this game since BETA came out and progressed from there on. Everyone is into the NEW hype-trend fast pace level up max character in one week using BMX3 bubble gum VIP double exp event using OCP gears that ive heard are compared to godly equips in a way. In which I don't have a problem with that either, everyone likes to rock the boat in different ways. I understand there are many preferences. You choose which one is your style. I have no problem with that. Call me an old geezerd or ol' school fashion style, but are there any other players out there that are like that too? Personally I think that if you live the "fast life" or play the fast life in this case, you burn out more quickly. That's why I've decided to take it slow and steady and enjoy every aspects of the game instead of just narrowing my mind only to focus on a few things: ET, MVP, Instances, PVP, WOE, PVM. There's more to the game than that! And everyone keeps saying that this game is dead. Edited by Canceroine, 18 December 2018 - 07:14 PM. Best-est way is to buy WPE and then sell it! It's called P2W!